There are five basic positions you can place the racket face on the ball. As pictured above you can hit the back of the ball. 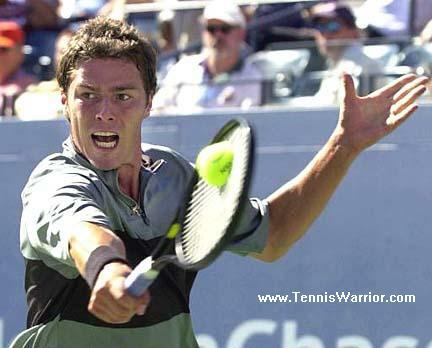 If Marat would place the racket face on the printing on the ball that is partially showing he would be hitting the outside of the ball. This would produce an angled volley to his right. on that side of the ball it would come in our direction! The top of the ball is the part that is facing the sky. And the bottom of the ball is facing the tennis court. When you hear players talking about hitting with an open racket face or a closed racket face this is referring to hitting toward the bottom or the top of the ball. Open racket face is the bottom of the ball and closed racket face is the top of the ball.